The Austin Parker 36 is built to the yard’s usual quality standards with comfortable accommodation and plenty of space for luxurious life on board. The cockpit, the largest in its class, offers record-breaking space. Stable, easy to pilot and manoeuvrable, the ideal craft for enjoyment at sea; the boat slants by just the right amount when turning, is agile and can be turned within its own length from a standstill by just running the two engines in opposite directions. For even easier manoeuvring with the two 260 HP Volvo Penta engines, owners can opt for the joystick version (available on both EFB and IPS versions) to simplify control of the craft even for fledgling yachtsmen. The design is well balanced, the perfect synthesis of meticulous styling, which gives the new jewel in the Austin Parker crown a sleek, elegant appearance. providing a seamless walkway just above the water. The light-filled interiors comprise a convertible dinette and a comfortable, well lit bathroom with separate shower, for enjoyable day-cruises with no lack of privacy. In the bows there is a large double bed which can be completely separate from the dinette. A large area underneath the cockpit, in the stern, houses a large bed for family-members for use as emergency accommodation. A vast choice of accessories allows a high degree of customisation, with optionals that enable the owner to design his craft to his needs and to interpret his own concept of life at sea. With a canvas top or plate glass hard top, the Austin Parker 36 guarantees total protection from the weather while still giving the cockpit plenty of light and air, and can be equipped with a fitted outdoor kitchen and power generator. There is a choice of stern drive or IPS system. 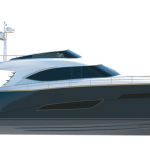 Top speed is over 36 knots, while the craft starts to plane at just twelve knots, giving a very long cruising range, while fuel consumption, with 2 engines (260 Volvo Pentas) totals 80 litres/hour at top speed and just 23 litres/hour at minimum speed.